"Are you sure this is Coconut Rice? I can't see any coconut in it." Yeah. 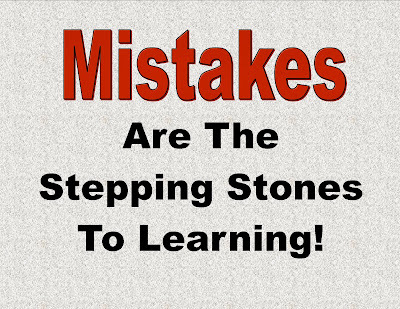 Mistakes are the stepping stones to learning. Everyday, I see people who are trying hard to not make a blunder. I see them at The Palms, extremely self-conscious. I see them in professional training classes, never volunteering to do anything or even ask a question. I see them at exquisite restaurants, struggling with the fork and knife. I see them at work, won't do anything without authorization or use their own initiative. They don't want to make mistakes, because they hate the embarrassment. Unfortunately, mistakes are the stepping stones to learning. So they keep passing up great opportunities to learn. Don't be too self-conscious to make a mistake, because someday you might end up paying heavily for not having the skill/knowledge that comes with making that mistake. I've forced myself to no longer be ashamed of my mistakes. Because of the not-so regular way I grew up, I ended up with almost perfect knowledge/skill in some things and almost no knowledge/skill in some very common things. And on the few occasions I went out with friends or relatives, I was always out of place. My comments kept making me look like an idiot, exposing my alarming ignorance of very common things. But the people that were close to me knew why and hardly made fun of me. The knew that there were some other things they could not dream of doing that I do effortlessly, and that they were some cool things I have almost impeccable knowledge of. One day, I thought about it all and I decided that I wouldn't bother about what some stranger I probably will never meet again thinks of me. I will go from one mistake to another as long as the people I care about aren't offended. And luckily, maybe because I care about very few people, I ended up not offending any of them and I learned all the things I should have learned as a kid. Now I'm almost becoming the guy that knows too much. And that's how powerful making mistakes are. The benefits greatly outweigh the cost. And I love the effect it has on people who compliments me on a skill, I just recently acquired, when I tell them all the embarrassing mistakes I've made before becoming that good. And the best part is they help you connect deeply with people: a new friend, a date, your spouse, your children, and your employees.